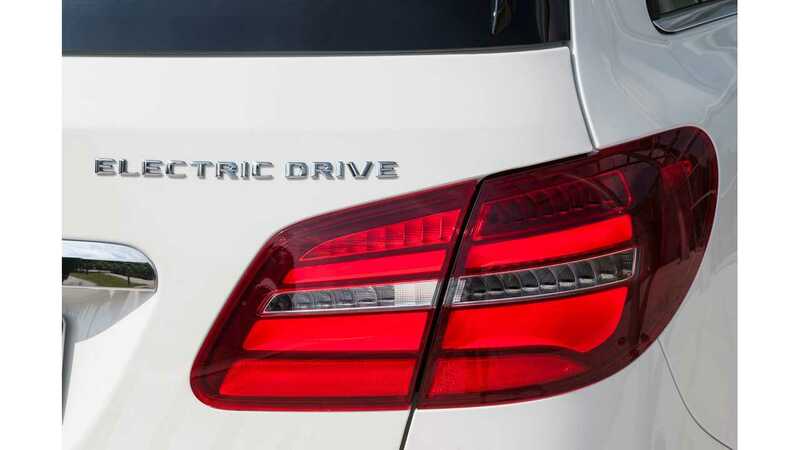 Mercedes-Benz To Ditch "Electric Drive" Name In Favor Of "e"
Electric Drive Will Disappear From B-Class In The Near Future. Instead, The Electric B-Class Will Be Known As Simply "Mercedes-Benz B ??? 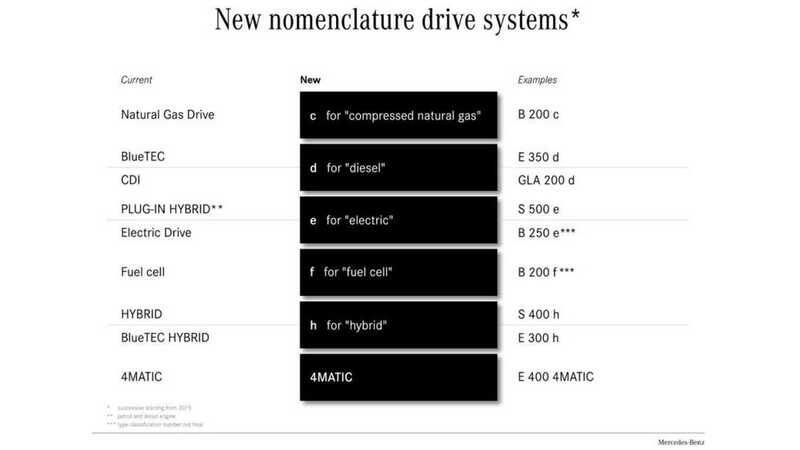 e"
Starting in 2015, Mercedes-Benz, along with Smart, will adopt a new naming convention for its vehicles. Of interest to us is that this switch will apply to plug-in hybrid and electrics. 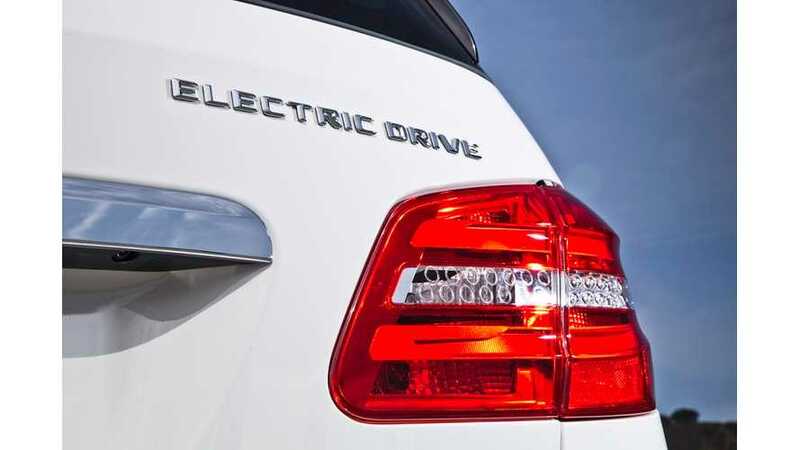 Both plug-in hybrid and electrics from Mercedes-Benz will adopt a simpler name: "e"
Gone is "Electric Drive" and the capitalized "PLUG-IN HYBRID" in favor of one lower-case letter applied to all Mercedes and Smart plug ins. So, what's now known as the Mercedes-Benz B-Class Electric Drive will become the B 250 e (250 denotes the torque rating of the electric B, but Mercedes does say that the use of 250 may change). Using that naming method, the Smart Fortwo Electric Drive will become the Smart Fortwo 96 e. Doesn't seem like a fitting name to us, so maybe just the Smart Fortwo e.
The Mercedes-Benz brand continues its dynamic progress. Two new arrivals in the Mercedes-Benz brand world were introduced today in Sindelfingen by Ola Källenius, member of the Divisional Board of Management of Mercedes-Benz Cars responsible for Marketing & Sales, and Dr Jens Thiemer, Head of Marketing Communications for Mercedes-Benz passenger cars. With the name Mercedes-Maybach, the brand represented by the three-pointed star is now broadening its offering in the exclusive top segment of the market with a new sub-brand, whose individual and prestigious exclusivity will appeal to status-conscious customers. Before the end of this November, the new Mercedes-Maybach S 600 will be celebrating its world premiere in Guangzhou and Los Angeles. The Mercedes-Maybach S-Class melds the perfection of the best automobile in the world, the S-Class, with the exclusivity of Maybach. In a further move, the Stuttgart-based manufacturer of premium automobiles will start 2015 by launching a new nomenclature, the system used for the designation of its various model series and engine types, so providing its customers with a simple and transparent way to find their bearings around its ever-growing portfolio of models. "The Mercedes-Benz brand stands for the aspiration to deliver 'The best' in terms of products, technology and services. For us, this means that we offer our customers vehicles that, by virtue of their different characteristics and specific flair, are able to fit in with all sorts of individual lifestyles. S-Class segment in particular, customers have very high expectations with regard to exclusivity and individuality. Mercedes-Maybach enables us to fulfil these desires in the exclusive top segment of the market". In 2013 Mercedes-Benz launched its new S-Class, the best car in the world. No other vehicle embodies the values of Mercedes-Benz in quite the same way as the S-Class. The scope offered by the S-Class model range is already considerable, even though its expansion from three to six model variants is not yet complete. The spectrum ranges from the sportiest S-Class of all time, the Mercedes-AMG S 63, the most efficient, the S 500 PLUG-IN HYBRID (in future S 500 e) and the most intelligent, the S 500 Intelligent Drive, through to the most beautiful S-Class of all time, the S-Class Coupé. When it comes to safety, assistance systems and partially autonomous driving, the S-Class is way ahead of the competition. The S-Class is not only the best vehicle, but also the most successful car in its class. With more than 100,000 units sold in its first full year of availability, it is even the best-selling S-Class ever. This success has been accompanied by a desire expressed by many customers for yet more individuality and exclusivity. They would like to drive the Mercedes-Benz S-Class in a highly exclusive and individual version that will allow them to stand out even further in this top segment. In the same way as it did with the sporty positioning of Mercedes-AMG, Mercedes-Benz has now therefore established a new offering in the exclusive top segment by introducing a sub-brand with the name Mercedes-Maybach. The Mercedes-Benz model portfolio has expanded rapidly in recent years and continues to grow. The comprehensive model initiative that is currently successfully under way means that, by 2020, the Stuttgart-based premium brand will have brought more than 30 models on to the market worldwide, among them at least eleven that have no precursor in the current product portfolio. On top of this come the different body variants and drive systems. This results in an increasingly complex situation when it comes to naming the various models. "After more than 20 years of continuity involving some of the most recognised and successful product names in the world, we are now making our system of vehicle nomenclature even more understandable. Bearing in mind the international appeal of our brand, our plan has been to devise an even simpler, more transparent and more logical system for the designations of our model series, with the aim of providing clear orientation for our customers", said Dr Jens Thiemer during the launch of the new nomenclature. "Now is the ideal time to do this, for in 2015 we will be updating virtually our whole SUV model range, providing us with the perfect starting point for renaming the whole family of vehicles." The system for the 4-door Coupés is constructed along similar lines. The first two letters, "CL", denote the origin, the third letter the link to one of the core model series: in other words CLA and CLA Shooting Brake, or CLS and CLS Shooting Brake. From 2016 on the Roadsters will all include "SL" in their names to denote their origin, with the third letter again the link to one of the core model series. The SLK therefore becomes the new SLC. As in the case of the G, the SL retains its designation as hitherto, in recognition of its iconic status. As has been the case until now, there will be no suffix for the petrol models. The defining and established designation 4MATIC for our all-wheel-drive vehicles will remain unchanged and, indeed, will be celebrating its thirtieth anniversary next year. Given the way that Mercedes-Benz has evolved into the leading brand for all-wheel drive, 4MATIC will in future play an even more important role in our model portfolio. As a result of a steadily growing demand, we will in future be adding further models to the all-wheel drive segment. "More clarity, more transparency, more consistency for Mercedes-Benz customers – we are convinced that our new nomenclature will support us in achieving this objective. The logic built up on the basis of the core model series will enable our customers to find their way round our growing product portfolio far better", was the way Dr Jens Thiemer summarised the new nomenclature. The expanded brand world of Mercedes-Benz now comprises two sub-brands alongside Mercedes-Benz as the core brand, whereby Mercedes-Benz stands for "The best", in a unique combination of emotional fascination and intelligent persuasiveness. Mercedes-AMG and Mercedes-Maybach interpret "The best" from the perspective of performance and exclusivity-seeking customers respectively. In addition, since the spring of 2014 "Mercedes me" has been opening up a simplified and individualised way in to the overall world of Mercedes-Benz for all customers and prospects, under the central concept of "The best for me". "By expanding our brand world we are able to offer our customers some new ideas about Mercedes-Benz", according to Ola Källenius. "Even more choice and individuality in terms of our products, and a transparent and logical structure around them in the form of our new nomenclature."